This week I took a little detour as part of my artist date. 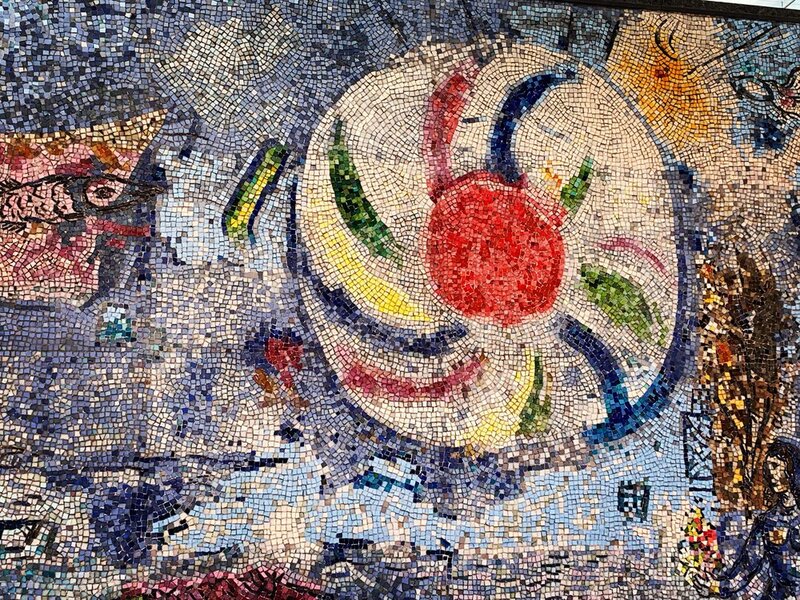 I tacked it onto a client meeting I had in the Loop and decided to go a bit earlier so I could stop and really enjoy the Marc Chagall mosaic located in Chase Tower Plaza. The piece is called Four Seasons and since I come to it from the east side since that’s where I get off the subway, I rarely ever have the chance to walk around the entire thing and just take it in. I intentionally gave myself extra time so I could enjoy all four seasons, like we have in Chicago. It was such a lovely experience, just to sit and look at the piece on the west side as well as the north and side sections. It helped that it was a gorgeous day so many people were out and enjoying the weather and their company. Marc Chagall’s Four Seasons in Chase Tower Plaza in Chicago. After my meeting, as I rushed to grab the train back since I had plans that afternoon, I decided to pause and walk into St Peter’s Church on Madison. In all the years I’ve lived in Chicago and worked downtown and trekked into the Loop for client meetings and passed this church, I’ve never once walked inside. Granted, I’m not Catholic so that may be one reason since it’s a Catholic church. Still, I craved the solace and my daily morning meditation has helped to remind me of the importance of slowing down so I figured, why not…I’m going to walk inside. I guess I wasn’t the only one who needed the solace and quiet from the busy-ness of life. While I wouldn’t say it was packed, for a Thursday afternoon, there had to be at least a good 30 people in the pews. The church is massive and beautiful. Marble statues, rows of wooden pews, candles lit, it really felt so calming. I left feeling not as rushed or anxious and it was a lovely feeling. St Peter’s Church on Madison Street in Chicago.